250 Los Angelenos gathered for Peace in Griffith Park. This past Sunday, September 16th, some 250 people responded to an invitation to gather for a Peace rally at Griffith Park. The hundreds who came together during the late afternoon at the Griffith Park Merry-Go-Round brought candles, and as the Sun went down, dozens of candles were lit in memory of the thousands who died in the Sept. 11th. Terrorist attacks. But the candles were also for those who may die in the near future from retaliatory violence. 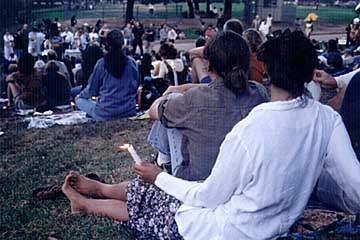 The gathering was organized by the L.A. "THE COALITION FOR WORLD PEACE" and it's main call was "No more innocent lives must be lost! There was no central or dominant political organization or platform at the open microphone. A decision had been made to simply bring people together and open the mic for all to speak. The crowd that attended was as diverse as the one might imagine for a city like Los Angeles. Anglos, Latinos, African Americans, Asians... Jews, Christians, Moslems, Buddhists, Native American Spiritualists, and others.... Gays and Lesbians. There were many Senior Citizens as well as people too young to have remembered ANY War. For many, the event was the first demonstration or political event of it's kind that they attended... and many vowed to work harder for peace in the future. The gathering ended when a dozen Aztec Dancers, dressed in their finest regalia, performed a ritual dance to "bless Mother Earth." Three Drummers beat out a primal rhythm as the Dancers flailed away. More candles were lit, incense was burned, prayers for peace were made. Soon the crowd broke up... carrying their candles into the darkness.